Status of Diamondback Rattlers in Ga. The March 31 registration deadline for this year’s Youth Birding Competition is only days away. The annual event set for April 22-23 is open to ages ranging from primary to high school. 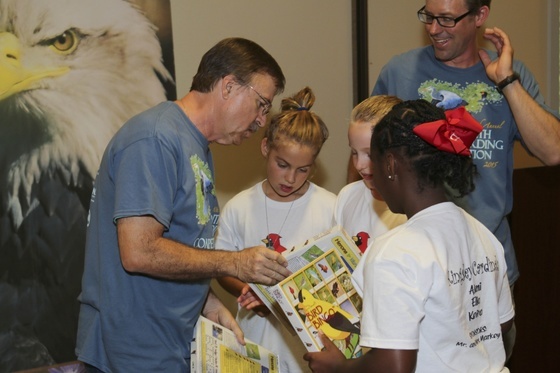 Youth of all birding skill levels are encouraged to take part. No experience is required. The birdathon ends in a free banquet packed with prizes and a wildlife show at Charlie Elliott Wildlife Center near Mansfield. Registration is online. Just remember to sign up by March 31. Got questions about the status and distribution in Georgia of eastern diamondback rattlesnakes, one-toed amphiuma or Barbour’s map turtles? DNR’s Nongame Conservation Section has answers. Petitions to list these and other species under the Endangered Species Act led to the reports summarized below. DNR provided guidance for scientists and conservation organizations doing the surveys. Findings will help inform U.S. Fish and Wildlife Service decisions on whether to list each species. Native to the Southeast's Coastal Plain, the largest venomous snake in the region is declining because of habitat loss, mortality caused by humans and other factors. 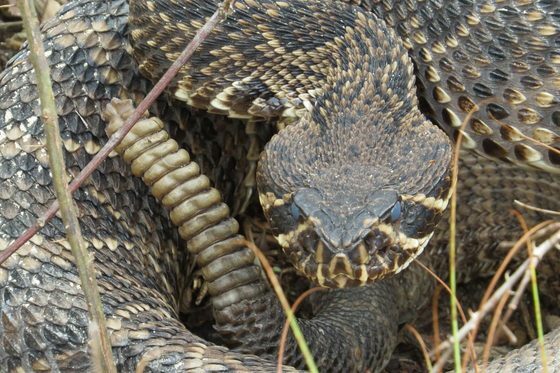 The Orianne Society used occurrence records from 2000-2015 and computer modeling to determine that while the southern third of Georgia remains a “population stronghold” for diamondbacks, suitable habitat is not extensive and populations are restricted to certain conditions. Significant surviving populations are associated with quail plantations in south-central and southwest Georgia, Altamaha River drainage uplands, and barrier islands and coastal strand regions. Full report. Concern about the plight and lack of data on these rare amphibians spurred surveys in 42 Georgia counties. No new sites for one-toed amphiuma were found, although the eel-like salamanders were confirmed at one place they’d been documented before. 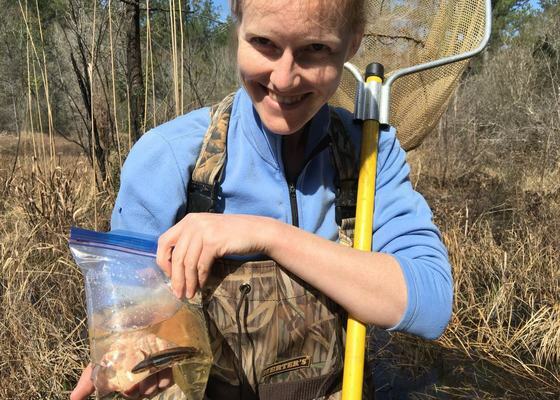 Researchers caught 115 salamanders tentatively identified as Chamberlain’s dwarf sallies. But genetic analysis linked the catches to another clade, or group, of Eurycea chamberlaini, one identified before and which will likely be described as a new species. No true Chamberlain’s dwarfs were found, indicating their distribution is probably restricted to the Carolinas. Full report. The presumed natural range of the species, whose adult females can double males in size, is the Apalachicola River drainage. Joseph W. Jones Ecological Research Center staff searched for basking Barbour’s map turtles from Lake Seminole north to Troup and Upson counties on the Chattahoochee and Flint rivers, respectively, and some tributaries. The Ochlockonee River was also checked. 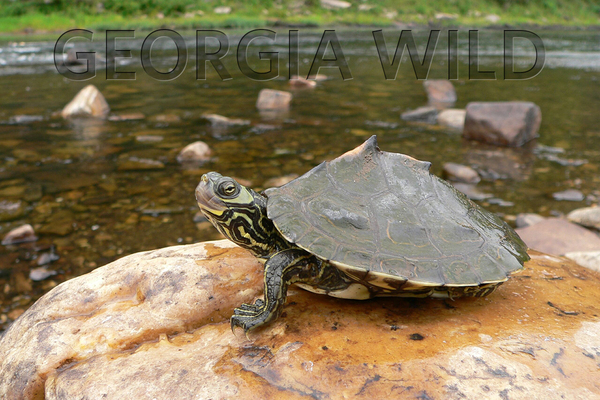 Barbour’s were the most commonly seen turtle on the Flint and the second-most species on the Chattahoochee. Full report. Also check out reports on Georgia blind salamanders, Dougherty Plain cave crayfish, alligator snapping turtles, Florida pine snakes and southern hognose snakes, along with other research. The snapping turtle research was profiled in Georgia Wild last spring (“Gator snappers slow to rebound,” March 31). 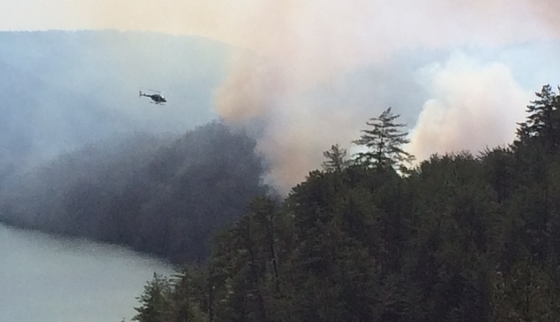 Controlled burns at northeast Georgia’s Tallulah Gorge are a challenge. Steep, rocky slopes test the stamina of crews and confound the use of fire breaks. Burns involve multiple landowners. And because the gorge is a tourist hotspot, home to a state park and historic Tallulah Falls, fire is a public event here. But prescribed fire is needed in this unique canyon. Flames open the cones of table mountain pines to seed. Native plants such as rare eastern turkeybeard, carnivorous roundleaf sundews and monkeyface orchids, proposed for federal listing, depend on the open forest canopy that regular, low-intensity fires create and maintain. Better-known species such as wild turkey and ruffed grouse also benefit. The team burn involving the U.S. Forest Service, The Nature Conservancy and DNR’s Wildlife Resources and State Parks divisions was the fourth prescribed fire in the unit and capped more than a decade of controlled burns at the gorge. Also in that time, fire-focused outreach led by the Forest Service has made great strides. Mary Beth Hughes, owner of Tallulah Point Overlook, a century-old store on the canyon’s edge, said that before when customers asked her about prescribed fire or burned areas, she had no information to respond with. “That has been remedied by the diligent efforts of the Forest Service and DNR,” Hughes said. Businesses are alerted to burns beforehand and given flyers to hand out. At the Overlook store, a Fire Learning Network-funded sign explains fire in the gorge. Positive effects are apparent in the forest, too. Signs vary from orchids blooming to peregrine falcons returning. The rare raptors nested in the gorge last year (“First Ga. wild peregrine nest since 1930s,” May 19) and have been again seen this spring. Learn about prescribed fire, a safe way to apply a natural process, ensure ecosystem health and reduce wildfire risk. Some options: GoodFires, Georgia Prescribed Fire Council, Georgia Forestry Commission, the Forest Service and DNR. Buy or renew an eagle or hummingbird license plate. Only $25 more than a standard peach plate, these tags support DNR wildlife conservation, including habitat restoration through prescribed fire. Donate through the Georgia Nongame Wildlife Conservation Fund state income checkoff when filing your 2015 taxes. By law, the fund supports conservation. More endangered salamanders have been found at Mayhaw Wildlife Management Area. Dip-netting ponds at the southwest Georgia WMA this month, staff from the Nongame Conservation Section, state Department of Transportation and U.S. Fish and Wildlife Service caught nearly 20 larvae of reticulated flatwoods salamanders. A year ago, larvae found at Mayhaw were the first documented in Georgia in more than a decade (“Rare salamanders at Mayhaw," March 31). The Atlanta falcons camera remains on hold because the peregrines at SunTrust Plaza Tower have not nested yet – at least not on one of four balconies where DNR can stream live video of the nest. Falcon fans are waiting, and watching to see if the birds might be nesting elsewhere on the building. Georgia's best summer camps include day camps at Charlie Elliott Wildlife Center, according to 365 Atlanta Family. The blog that draws a reported 250,000 readers a month says the camps at the Mansfield center help youth gain outdoor skills while hiking, exploring and searching for wildlife. With calving season for North Atlantic right whales coming to a quiet close, DNR and partners have documented 14 mother-calf pairs off the Georgia/north Florida coast, comparable to recent winters but shy of the 20-a-year sightings averaged over the past 10 years. To the north, however, the endangered whales are returning in record numbers to Massachusetts’ Cape Cod Bay, a prime foraging area before totals declined in the late 1900s. DNR’s Venomous Snakes of Georgia brochure has been updated. Featuring new range maps, occurrences and regulation details, this guide to the state’s six native venomous species is available online, via DNR and through UGA Extension, the Georgia Southern University Center for Wildlife Education, Southeastern Reptile Rescue and The Environmental Resources Network. Sea turtle strandings – dead turtles washing up on the beach or strand – are a key index to the threats marine turtles face in near-shore habitat. A five-year review of strandings by the Nongame Conservation Section found that commercial fishing and boat collisions remain the primary sources of mortality, but loggerhead and leatherback sea turtle strandings have declined significantly in the last 27 years. 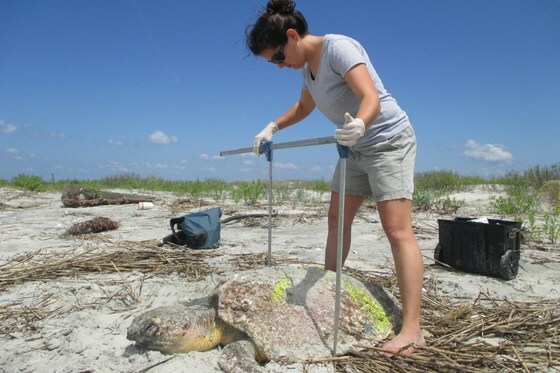 Sea turtle research overview in Nongame Conservation’s annual report. Birding by the rule? In his new column “The birdist’s rules of birding,” Audubon Society’s Nick Lund writes to the “bird curious” on topics such as identifying the mystery bird at your feeder (rule 58) and why it’s OK to hate starlings (rule 72). Spring means more people in the woods. A big part of the draw, of course, is hunting and fishing, with Georgia’s turkey season opening Saturday, March 26, and plans to stock more than 80,000 trout in mountain streams this week. Keep track with the new Outdoors GA app, available free at the Apple or Google Play Store (search “Outdoors GA”). Ga. 99 north of Darien will be a more colorful drive, thanks to 20 wildflower plots planted recently to promote native pollinators. Nongame Conservation, Ashantilly Center, McIntosh County 4-H and Coastal WildScapes seeded 14 plots with species native to coastal Georgia and collected locally. Growth and pollinator traffic in native plots vs. six planted with store-bought seed mixes will be compared. 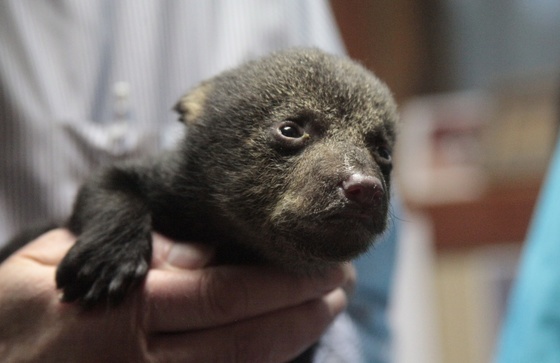 The Louisiana black bear, inspiration for the teddy bear, will be removed from the federal list of endangered and threatened wildlife. U.S. Secretary of the Interior Sally Jewell credited the “delisting” to 24 years of dedicated recovery efforts by an array of partners. Photos. Landowners interested in applying for conservation funding through the U.S. Agriculture Department’s Regional Partnership Program have until May 10 to file pre-proposals. Up to $260 million is available through the Natural Resources Conservation Service program, which requires that applicants match federal awards with private or local funds. Names in the news: Dr. Jessica McGuire, manager of DNR Wildlife Resources Division’s Private Lands Program, and senior wildlife biologist John Jensen with the agency’s Nongame Conservation Section helped coauthor the recent paper ““Disease dynamics of red-spotted newts and their anuran prey in a montane pond community” in the journal Diseases of Aquatic Organisms. - A funding solution for conserving nongame nationwide. - How to choose the right binoculars. Right whale and calf in Sebastian Inlet, Fla., in February. Details in Right Whale News. 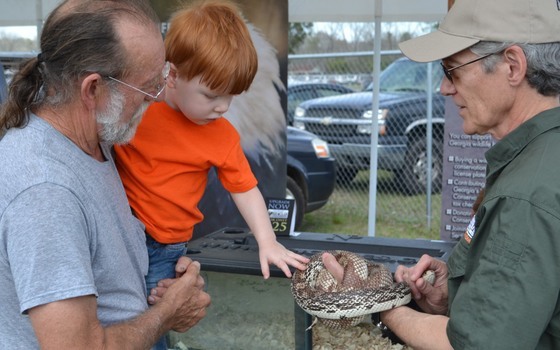 A young visitor at the Claxton Rattlesnake & Wildlife Festival has a close encounter with a pine snake held by Dr. Jon Ambrose, chief of the Nongame Conservation Section. The Evans County Wildlife Club event, held this month near the south Georgia city, promotes Georgia wildlife and conservation to crowds numbering more than 10,000 each year.